Beside of the cheer architecture, the location of a fortress attracts visitors` attention since it is often located on a panoramic place. It is a perfect combination of history, nature and view, which tells stories from centuries ago that remain up to our days. In the next articles you can read about the most powerful and unique fortresses in Europe. The first three are built before 17th century and the other three after 17th century. The difference can be noticed in the purpose of their construction. These in the early period were used for defence purposes, but behind their main purpose there is a history of another use, like a place for living and usually they are situated on more picturesque places. The fortresses built after the 17th century are often used for military purposes or as prisons. The architecture is more monotonous and functional. It is not absolutely necessary for the location to be on a really high place and some of these fortresses sometimes are surrounded by water and have underground tunnels. It is also called the Saxon Bastille and it is a unique monument to the art of European fortress construction. Its 750 years' history have made it an impressive configuration of late Gothic, Renaissance, Baroque and 19th century architecture. Through history, the fortress housed some important persons and items. 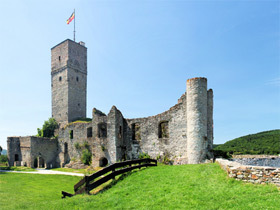 Also an important fact is that the Saxon royal court fled in the fortress during various wars including the Seven Years’ War and the revolutions of 1848. Curious to discover the secrets of porcelain production, Johann Böttger was imprisoned in the Saxon Bastille for failing to produce gold. Czar Peter I, Frederic the Great, and Napoleon slept in the fortress too. During the Second World War, much of the art collection from the impressive museums in Dresden was hidden for safekeeping. At that time, Festung Königstein served as prison for senior French officers – General Henri Giraud made the only successful escape ever from the fortress. The Königstein Fortress is situated on a hilltop near Dresden, in Saxon Switzerland, Germany, on the left bank of the River Elbe. It is one of the largest fortresses in Europe. It also sits on a plateau of the same name and has some parts which are as many as 400 years old. It has a 152.5 meter deep well in its centre, the second deepest well in Europe. The fortress is surrounded by a wall almost a mile long to enclose a protected area of 24 acres. Access to Festung Königstein is possible via a modern panorama elevator that replaced the original sixteenth-century hoist. Another way is via the original very steep path. The latter is the most interesting opportunity to enter but can be very slippery when it is wet. Festung Königstein is a 20-minute hike with some steep slopes from the centre of the town Königstein. The route is well signposted from the station. An easier alternative is to the use the Fortress Express – a vintage-look double-decker bus that runs from the train station to just below the fortress entrance. The Belgrade Fortress was built by the Romans during the period from the 2nd to the 18th century and is located on an exceptional strategic position. For a long period the city population was concentrated only within the walls of the fortress, thus the history of the fortress, until most recent history, equals the history of Belgrade itself. Under the rule of Despot Stefan Lazarević, Belgrade became the new capital of Serbia and was reinforced by the addition of extensive fortifications to the Upper and Lower Town. The Despot’s palace was built in the old castle, and a military harbour was added on the Sava river. An advanced medieval city developed within the ramparts. The Belgrade Fortress is situated on the confluence of the River Sava and Danube, in an urban area of modern Belgrade, the capital of Serbia. It is located in Belgrade's municipality of Stari Grad and is height is 125.5 meters. The nature that could be seen around the fortress is fascinating, high above the rivers, on a rocky ridge, from where a lot of places can be observed like Novi Beograd, Zemun, and wide plains of Pannonia, is the Belgrade Fortress and Kalemegdan, the former historical and urban centre of Beograd (Belgrade). This powerful fortification is known to have existed since at least 973 AD and was previously the castle of Ghino Di Tacco. It has been the symbol of the defence and control over the Via Francigena, on the border between Tuscany and Lazio. Furthermore, the fortress had a considerable military importance, being a a stop for both pilgrims and travellers. The fortress was capable of resisting to the most violent attacks, even against artillery fire. The most famous personality of Radicofani is Messer Ghino di Tacco, the “Gentleman Bandit“, who lived in that place at the end of the 13th century. He was also mentioned by both Boccaccio and Dante in their works. They described him for his sometimes tyrannical and cruel deeds but always dedicated to do good. It is well- known that Ghino di Tacco is the Italian version of Robin Hood. Located at an altitude of 896 meters, the fortress is situated on the highest peak of the hill, on the southern border of the beautiful Natural Park of the Val d’Orcia. Over the centuries it was renovated a few times, but most of the façade is still original. The fortress provides beautiful views of the surrounding regions and if it is a clear day visitors can also see the tower of the castle in Siena. There are no public transports to Radicofani; Car is most appropriate; car hire in Chiusi right in front of railway station. The initial construction of the fortress, which took place under the supervision of Ambrose Precipiano, took six years from 1668, but the whole work continued over thirty years. The final result was that by 1711, the Citadel was one of the strongest fortifications of the period. During the First Empire the Citadel housed Austrian, French and, Spanish prisoners of war. After in the period of the First World War, Besançon was sufficiently far from the front that the fighting left the Citadel untouched. During World War II the Germans captured the Citadel in 1940. After heavy fighting, the Americans captured the Citadel in 1944 and used it to hold German prisoners of war. After the Second World War, the Citadel initially served as a military depot. The Citadel is one of the finest masterpieces of military architecture which occupies eleven hectares on Mount Saint-Etienne, one of the seven hills that protect Besançon, the capital of Franche-Comté. There is a 375 m long ship tunnel under the fortress hill. The Citadel overlooks the old quarter of the city, which is located within the oxbow, and offers a gorgeous view of the entire city and its beautiful surroundings. Today it is an important tourist site because of its own characteristics and because it is the site of several museums. There are some companies that offer sightseeing boat tours with a "Bateau mouche" or it is possible to drive a circuit around the town centre by boat. When the Portuguese proclaimed their independence from Spain, a lot of conflicts and battles appeared. The Fortress of the Concepcion was one of the new fortress constructed by order of the Duke of Osunal, commander of the Spanish Army and the construction began in 1663. It was located in the area of the border between the River Coa and the River Agueda which became a buffer zone between the two kingdoms, so the fortress could serve as a military station for the Spanish army to recover Portugal. It is located 0.6 miles west of the village of Aldea del Obispo and is in the province of Salamanca, western Spain, part of the autonomous community of Castile and León. From a distance, the fort looks in a remarkable shape, with many of the walls and casements still standing. From Ciudad Rodrigo go west on E 80 until right before the border crossing station (about 17 km.) Look for the sign for Aldea del Obispo. Head north for about 15 km. Right before you arrive in Aldea del Obispo, Fort Concepcion will be on the left. Following the 1746 defeat at Culloden of Bonnie Prince Charlie, George II created the ultimate defence against further Jacobite unrest. Fort George was finally completed, behind schedule, in 1769. The result, Fort George, is the mightiest artillery fortification in Britain, if not Europe. The fortification is based on a Star design, it remains in a very good condition and nowadays is open to visitors with exhibits and recreations showing use at different periods, while still serving as army barracks. Fort George is situated behind its massive grass-topped artillery defences on an isolated spit of land, on the West site, into the Moray Firth at Ardersier in Scotland. The huge fortress covers 42 acres, and was designed to provide all the facilities of a small town. Its amazing buildings and superb collection of arms - including bayoneted muskets, pikes, swords and ammunition pouches - provide a fascinating insight into 18th century military life. The main entrance is a long walkway, complete with drawbridge, across a wide ditch set between heavily defended bastions. Inside the fortress are the barracks which were built to accommodate the 1600 men of two infantry battalions and the gunners for the artillery. The barracks are still in use as a military establishment, but much of the site is open to the public. There is a very famous museum for the tourists inside the Fort George, called Highlanders' Museum. There are some sensibly-timed buses for tourists to Fort George (or at least Ardersier), as this is the premier visitor attraction of the Inverness area.